Borisova Gradina is one of the oldest and most recognised parks in Sofia. Its central location makes it easily accessible from any part of the city whether by metro or bus. It has a lot of paved and dirt trails that make it a urban runners paradise. Some parts of the park are poorly lit at night so it is wise to bring a headlamp. Although not my recommend form of transport to Borisova Gradina parking is avaliable at Vasil Levski Stadium, free of charge. However during daytime hours the parking is often full and during football games parking can be prohibited. 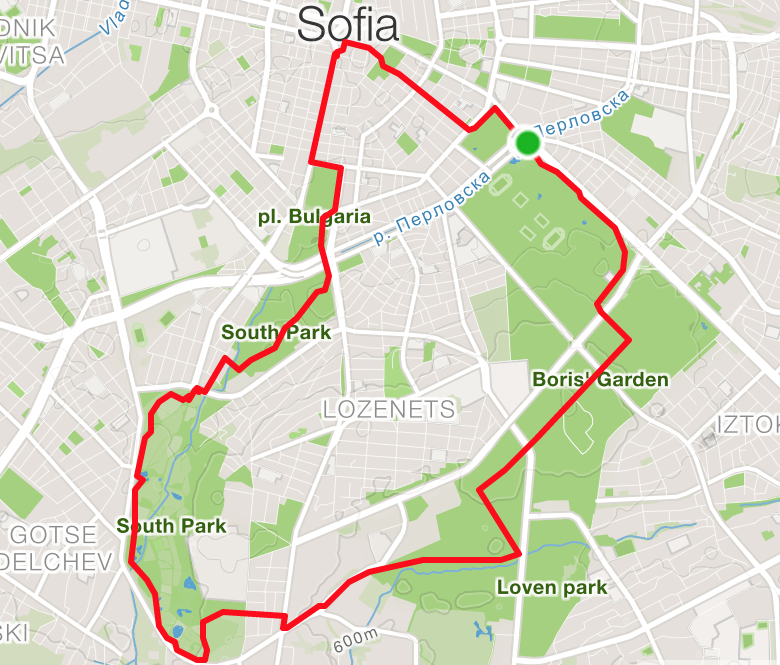 Description: This route underlines one of my favorite things about Sofia, the parks. I run this loop or a variation there of probably a few times a month. Start again at Eagles bridge and head up the path parallel to the boulevard. Cross under the street through the tunnel then climb the short steep climb before reaching the tennis courts turn right climbing up hill to another street crossing. Continue across the street and on to the dirt trail that climbs before descending rapidly under some power lines. The next street crossing has no pedistrian markers so make sure to stop and watch the traffic. Directly across the street there is a gap in the fence, follow the trail there with the large orange triangle markings. After a few hundred meters you will turn left on the wide gravel path that will continue to some abandoned buildings. There turn right, beware there are often some stray dogs here but they mostly are sleeping. Continue on the path for almost a 1.5km and you will reach a boulevard. Cross the boulevard to the opposite and head south east towards Paradise Mall. At the stoplight, turn right then take the pedestrian crossing to the left. Follow the street down another few hundred meters before you enter South Park. From here my favorite route is to stay left always. This will bring you around the far side of the park roughly 3 km from your entrance. From there at the pedestrian crossing turn right past the bakery and then left on the road passing the football field and the yellow building that follows. Here turn right crossing the narrow bridge into a new park, where you will turn left on the main dirt path that will lead to the Hilton. At the Hilton cross the bridge over McDonalds and towards NDK. Traverse the NDK park to the Pedestrian street Vitoshka follow it all the way to Saint Sunday Church where you will turn right onto the street the exits the large plaza near the hotel. This high end shopping street will bring you to the park in front of the National Theatre, continue to the left of the theatre. Cross another boulevard and past a Billa supermarket eventually you will end up at a large boulevard (Vasil levski), that you can cross to the small garden and return to Eagles bridge.